Chobe Marina Lodge is uniquely located in Kasane in the north-eastern corner of Botswana, where the African nations of Zimbabwe, Zambia, Namibia and Botswana converge. This tranquil haven is surrounded by the natural beauty of Africa. 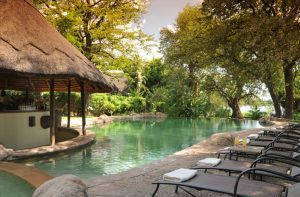 The Chobe River, Chobe National Park, Kasane Forest Reserve, the Caprivi Strip and the mighty Zambezi River, each offer their own attractions and with Victoria Falls but 70 kilometers away, Chobe Marina Lodge is a ‘must visit’ destination when in Southern Africa. The Chobe Marina Lodge comfortably immerses guests in the breathtaking, natural environment that Africa has to offer, while providing the best African safari experience with a unique natural, warm and comforting aesthetic. Whether you stay in one of the studios, chalets or suites, a memorable stay is guaranteed! Guests at Chobe Marina Lodge are accommodated in 66 beautifully appointed rooms comprising 6 Honeymoon suites, 16 standard studios, 14 studio suites and 30 luxury suites. Accommodation at Chobe Marina Lodge offers a choice of guest rooms fromthatched studios, apartments, chalets and suites with private lounges. 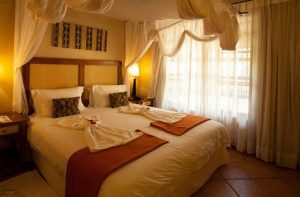 Each is beautifully appointed and overlooks the Chobe River and landscaped gardens. All include the modern comforts of air-conditioning, television, telephones, mini bar fridges – stocked on request and daily housekeeping. Chobe Marina Lodge with its lush expansive gardens are home to an abundance of wildlife, including the legendary fish eagle, warthog, squirrel, mongoose, vervet monkeys and fruit bat. Two restaurants and wonderful wooden decks over the river make this hotel truly world-class. With the world-renowned Chobe National Park just 10-minutes from Chobe Marina Lodge, an encounter with Africa’s awesome foursome (elephant, leopard, lion and buffalo) is bound to occur. 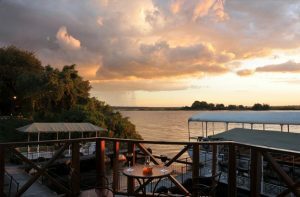 Dine in opulence and sheer class at Chobe Marina Lodge, where good food and comprehensive service are part of the mix. Commissioners A La Carte Restaurant serves world-class dishes beautifully prepared by our experienced chef. For a more informal meal try the Mokoros Restaurant, which offers local cuisine in a lighthearted, friendly environment. At Cathari Health & Beauty Spa pamper yourself with our menu of body services, facials, hands and feet treatments done by our team of carefully selected professional beauty therapists. The treatments were all designed for your total relaxation and well-being. Beauty Mobile Spa was formed to service the needs of rapidly expanding massage demands of the guests who want to go back to their busy schedule or hectic life fully refreshed.